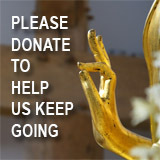 Houston, Texas (USA) -- Ho Chi Minh City is set to erect a new 6.3-meter-high bronze-cast statue of Buddhist monk Thich Quang Duc, the ascetic who famously immolated himself in the streets of that city (then called Saigon) in protest against the repressive US-propped South Vietnamese government more than four decades ago. The statue will next month be symbolically placed on the very spot in the city where the monk was depicted in iconic photographs burning himself to death. With its raising, the Communist Party-led government's new and altered representation of the so-called American War will be on show for the world to see. Muted in this revisionist retelling is the country's revolutionary history against colonialism and the many decades of its attendant oppression. Re-established instead is Vietnam's willing identification with the West and its emerging reconciliation with the American War. As a consequence, the conflict is being minimized for foreign visitors while a new history that transcends recent animosities is emphasized. To be sure, the state-run tourism industry still uses the term "foreign aggressor", but rarely directly associates it with Americans. Meanwhile, most of the tourism industry's new investments are allocated to renovating and renaming colonial-era hotels, buildings and streets in a bid to revive tourist-friendly colonial nostalgia and allure. This multimillion-dollar marketing ploy serves as a way to call foreign attention to the "new" Vietnam, one that sheds the baggage of the war and embraces ancient traditions as well as Western influences. This new attitude will be highlighted in the country's upcoming global tourism advertising campaign, which will air on CNN, among other media outlets, for 13 consecutive weeks starting this autumn. A growing number of Viet Kieu - overseas Vietnamese living in the West - are also attracted to the "new" Vietnam, portrayed in stark contrast to the country that they and their families were forced to flee for fears of communist reprisals after South Vietnam surrendered in 1975. In the early years under communist rule, US commodities and consumer lifestyles were suddenly no longer viewed as indices of south Vietnam's modernity. Instead, the reactionary communists treated them with the same postwar trepidation reserved for unexploded mines or toxic chemical dumps, famously claiming that US influence had "soiled the souls" of millions of young Vietnamese. Fast-forward to the present, and Vietnam is rapidly opening up to the world with its accession this year to the World Trade Organization and recent trade and investment promoting pacts with the United States. Once considered dangerous, now the Viet Kieu's association with the US is seen as having considerable market value to the more outward-looking, market-oriented Communist Party-led regime. So does all this mean that the more capitalist south is now winning the peace? The irony is that while the Communist Party's revisionist history offers benefits over a range of political and economic venues, including improved relations with the US, "The inherent danger, however, is that the price paid of this nostalgic retelling of quaint colonialism may be a return to it," conclude Laurel Kennedy and Mary Rose Williams in a recent scholarly analysis of Vietnam's tourism industry. That is, a new generation of Vietnamese, whose families fought so vigorously against colonial oppression, is now making a living off the Western-led global tourism industry. High-end Western-led tourism megaprojects, such as Australian professional golfer Greg Norman's two 18-hole golf courses being built as a part of a luxury 350-room resort complex in the former US military base city of Da Nang, are becoming an increasingly common sight. The benefits of the largely state-controlled tourism industry, of course, are distributed unequally through the Communist Party's modern-day feudal system. Personnel from the various ministries and committees that oversee the industry are often the same people who own or have major stakes in the hotels and other big new joint-venture tourism projects. Vietnam's emergent but still small middle class is by many accounts either closely associated with or dependent on such government connections for their improved livelihoods. The thesis that with greater affluence Vietnam's growing middle class will push for more democracy misses the importance of this connection to the political status quo. More likely, old-fashioned Marxist class conflicts will emerge, as the masses who can barely make economic ends meet are sensitized to the association of the country's nouveau riche with government-linked privilege and corruption. Despite the country's recent economic boom, the average Vietnamese's annual income is still only US$650. Like the French colonizers, the Communist Party-led government has decided to allow its citizens to modernize with only selective Western ideas, including the embrace of more tourism. At the same time, the regime prohibits behavior it deems threatening to the continuity of the one-party system it dominates. These perceived threats can be as trivial as university art students performing at entertainment sites supposedly "prone to social vices", including pubs and karaoke bars. And resultant bans can be as serious as cracking down on labor strikes and worker protests, toward the aim of protecting the foreign-investment-led, export-oriented economy, which includes the foreign-currency-earning tourism industry. While the state-run tourism industry promotes the country's religious traditions to draw foreign travelers to Vietnam's exotic temples and pagodas, religious groups are still being persecuted in their call for social justice and religious freedom. That includes official pressure to register with the state authorities, from which groups are instructed to exhibit "politically correct" attitudes and behavior - translated: don't challenge the Communist Party and its monolithic political system. The punishment for transgressions, as many monks and priests have learned the hard way, can be physical abuse and prison sentences. That explains why a number of religious groups in Vietnam have refused to register with the authorities and are forced to practice their faith underground. From this, the government's plan to commemorate the self-immolated Buddhist monk Thich Quang Duc with a new statue marks an important and glaring contradiction many foreign tourists won't, but many locals will, recognize. As the Communist Party outwardly attempts to illustrate to foreign visitors that Vietnam is finally reconciling with the American War, internally it continues to restrict space for independent religious groups and freedom of expression. 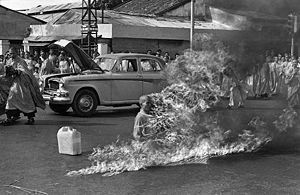 Moreover, it also distracts from the original reason Thich Quang Duc chose to set himself aflame. 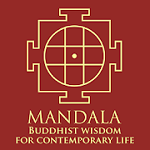 In one sense, the monk's act transcended both politics and religion, since in Buddhism to commit an act of self-destruction is a transgression of the faith's central tenants. Instead, his act was to burn constructively, seeking salvation for his people's sufferings while also attempting to move the hearts of their oppressors. His was an act of selflessness to fight against the enemies of humankind, aimed then at the Saigon regime, but just as relevant today in relation to the current Communist Party regime. Buddhism's principles of compassion and amnesty are far beyond the Communist Party-led government's oppressive reach, and the ancient faith's role in Vietnamese politics has steadily diminished and gradually been replaced by Confucianism in recent decades. At the same time, they continue to harass and detain outspoken religious leaders of all faiths, including the Venerable Thich Quang Do of the outlawed Unified Buddhist Church of Vietnam, who has been under house arrest since 1981. Religious freedom in Vietnam has improved only at the margins, and only on the Communist Party's harsh terms and conditions. Government-registered and -monitored religious groups now have more places for public worship; but those sanctioned shrines, including many Buddhist temples in Hanoi, are plastered with Ho Chi Minh's socialist slogans, while their after-school programs are saturated with socialist revolutionary history and song. With that in mind, the Communist Party's bid to commemorate the memory of the dissident monk Thich Quang Duc would be better contextualized in the regime's ongoing crackdown on religious freedom than as any meaningful reconciliation with the country's colonial and war-torn past. As the regime bids to build a new and tourism-friendly Vietnam, the contradictions rife in resurrecting and co-opting the memory of the self-sacrificing monk could not be starker. Dr Long S Le is the director of international initiatives at the Global Studies Center and a lecturer in Vietnamese Studies at the University of Houston.